Peppers , Lots Of Peppers! What’s coming in from the gardens at the moment? Lots and lots of peppers! 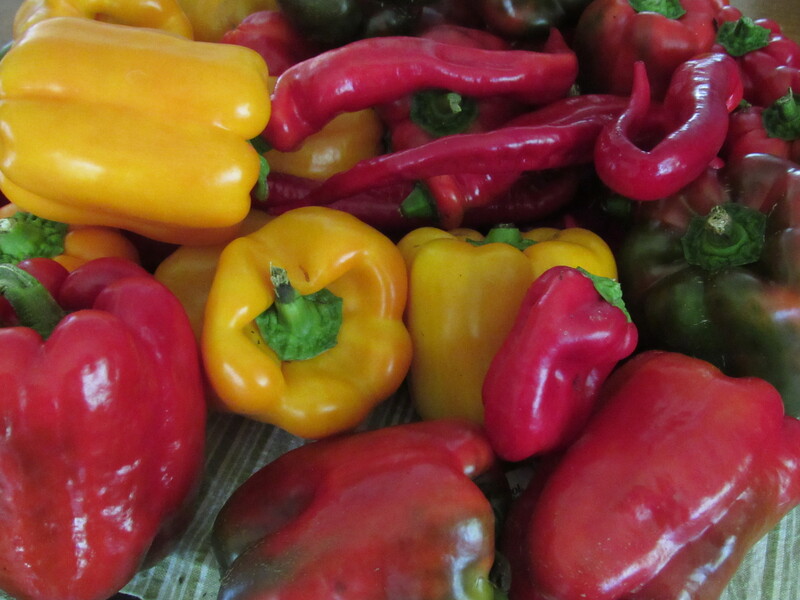 Having a bounty of fresh sweet red, yellow, and green peppers is a treat. 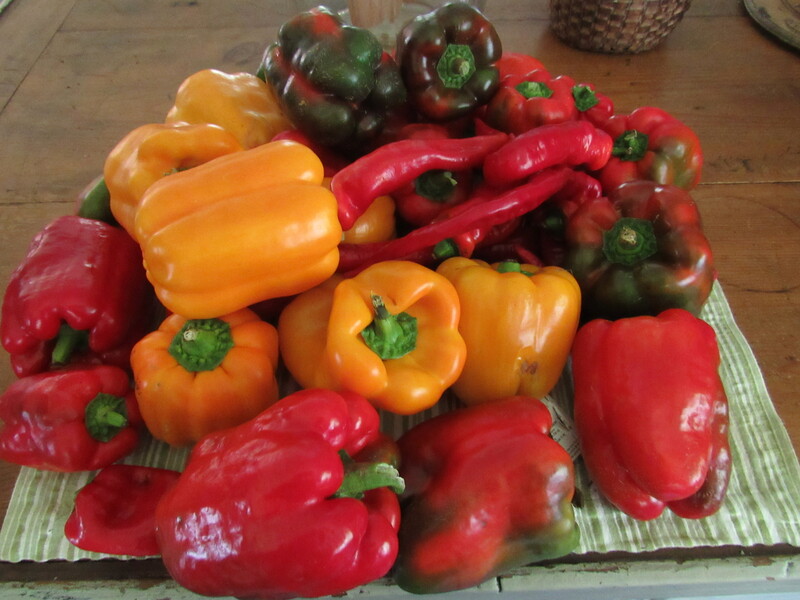 A large sweet red pepper can get pricey at the market.They are coming out of the garden in buckets , along with tomatoes, beets, cabbage, beans, and eggplant. We’re ignoring the squash. Roasting peppers over a charcoal fire is our favorite way to eat them. Everyone in the house loves the addition of roasted peppers on their burgers and in their sandwiches. We will freeze some, freshly chopped and frozen, as well as roasted and then frozen. The consistency of course is nothing like fresh, but the preserved peppers will be added to soups and dishes where they are not intended to be a main ingredient. We have canned roasted peppers. Being low acidity, they need to be processed in a pressure cooker. I’ll leave you with these instructions for canning or freezing peppers (http://anrcatalog.ucdavis.edu/pdf/8004.pdf). 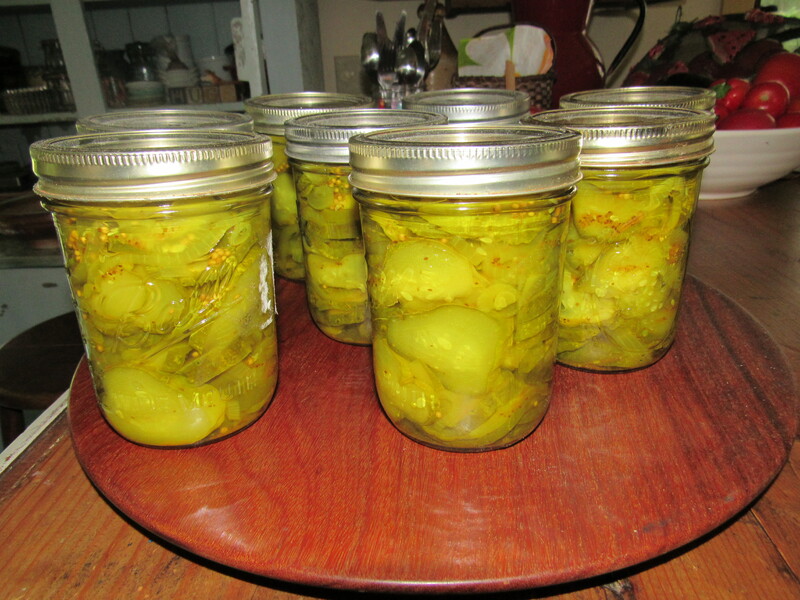 It is important to follow careful steps with canning, especially with vegetables that you aren’t going to pickle and are considered low acidity. Oh, and what’s our favorite salad at the moment? The easiest cucumber salad that is quite divine ( yep, buckets of cucumbers, too). 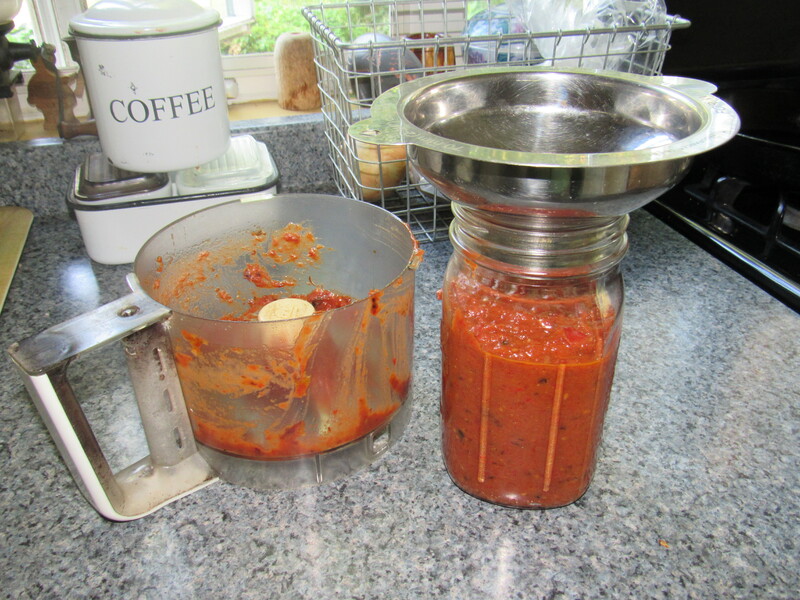 Let this sit for an hour or two in the fridge…….quite yummy, and lovely on sandwiches! 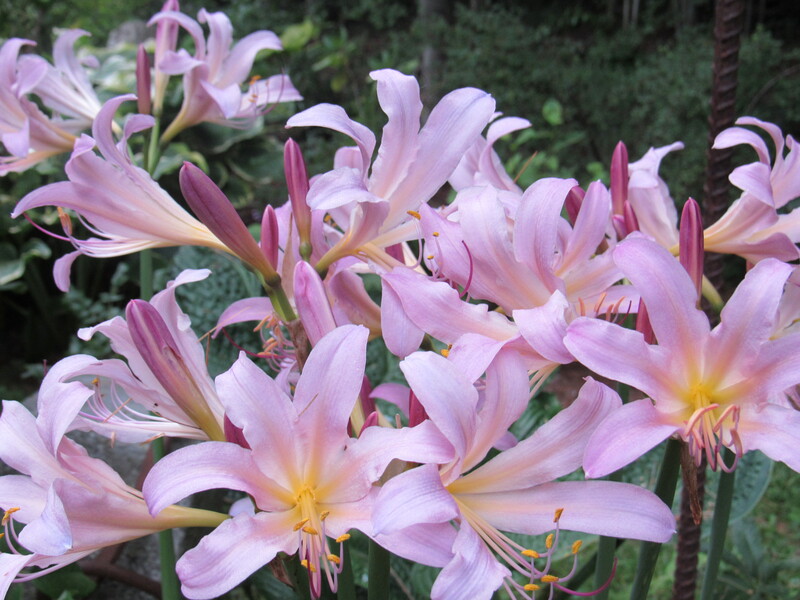 The Lycoris squamigera are in bloom, also referred to as ‘naked ladies’. 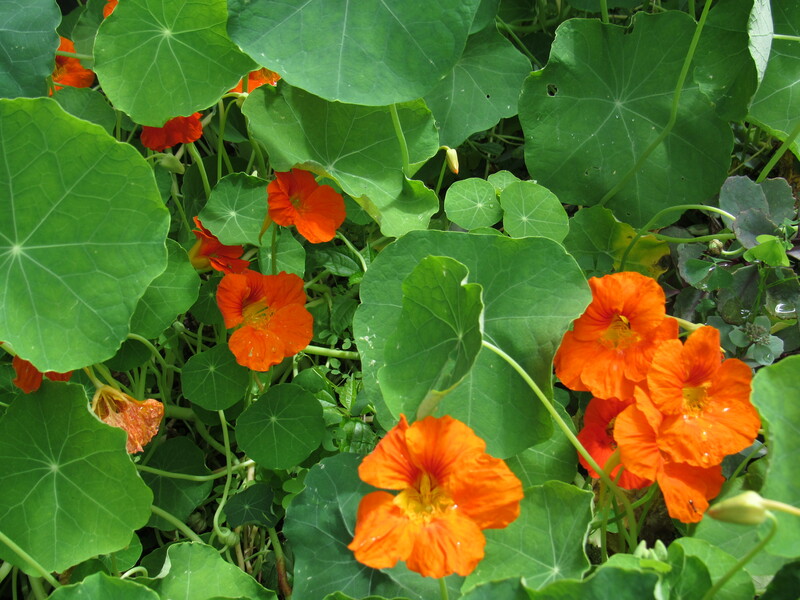 We have them growing in part shade ( they also do well in sun) along the display beds. 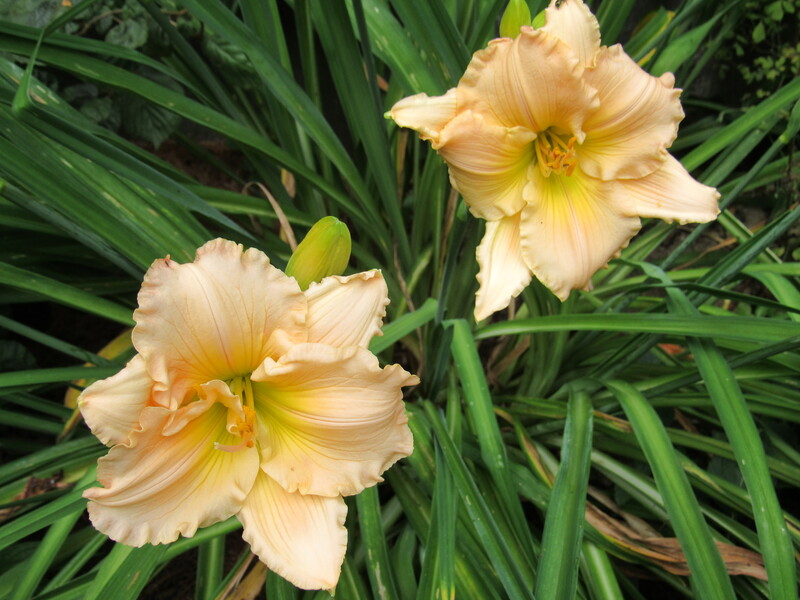 Lycoris are in the Amaryllis family, their foliage comes up in early spring and then dies back, then reappears in late August. 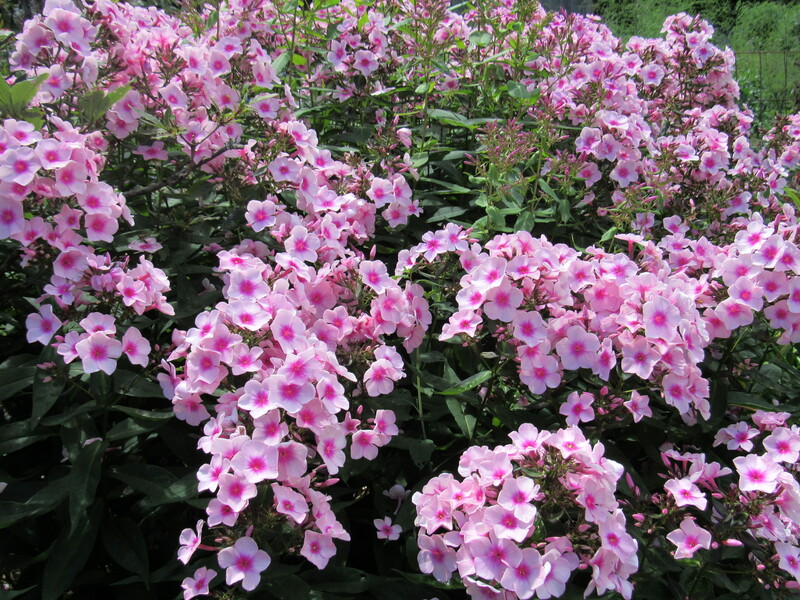 Long naked stems grow from where they had spent some summer dormancy, then their wonderful and fragrant blooms appear. 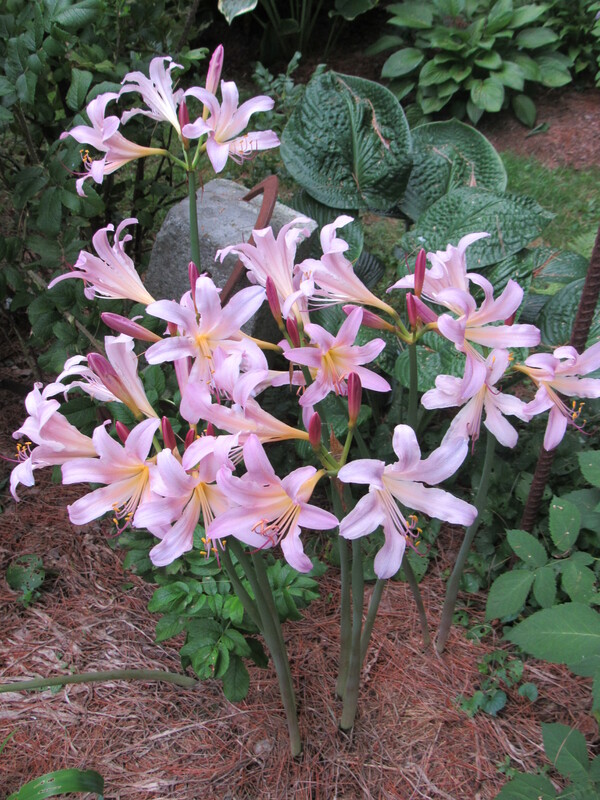 The blooms do resemble an amaryllis, this particular species having flowers that are pinkish with a lilac tinge to them. 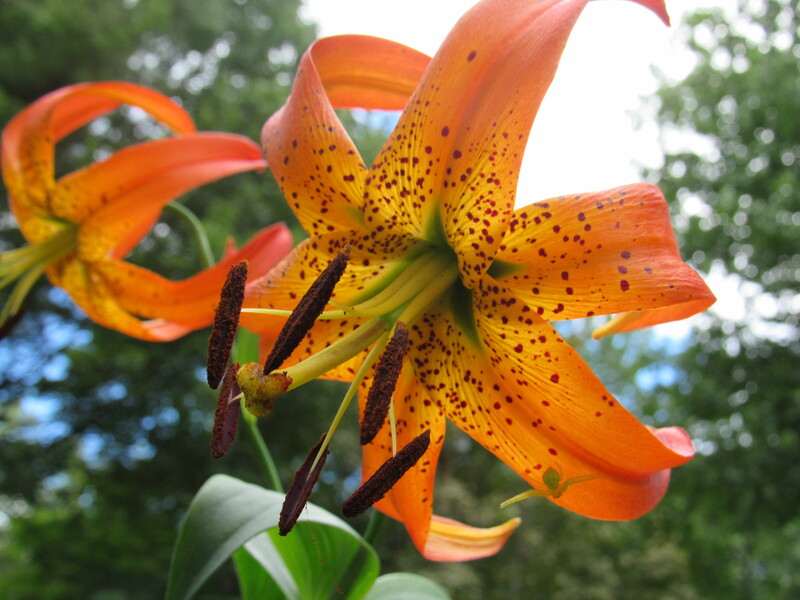 They look wonderful popping up among all the green in the shade gardens. 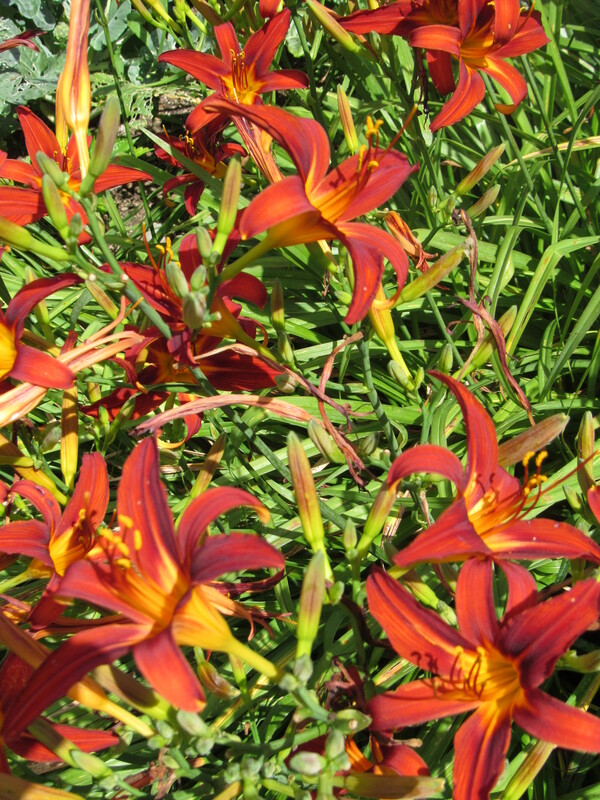 Lycoris is also often referred to as ‘Resurrection flower”, because of its early spring emergence, then mid summer dormancy, only to reappear ‘as if from the dead’ with it’s wonderful blooms. Still so much to enjoy in the gardens. We often do much of our transplanting and filling in spots around the gardens during the later part of August and throughout September. The rain we’ve been having is very helpful. The nursery continues to be busy with gardeners doing the same….getting a few more things into their gardens before the snow flies! Still plenty of Lycoris for sale here at the nursery! We will welcome the cooler months of fall as they approach, but can’t wish for the summer to end any time soon, there’s still so much to do. 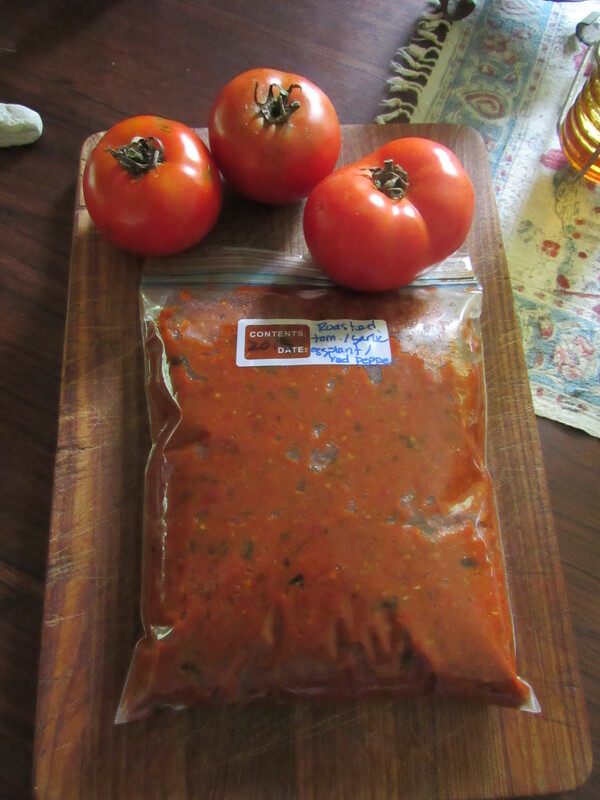 And cooking up gallons of this……. We thought it may be helpful to go back and repost an old entry on how we do it……. ( click the highlighted ‘old entry’ to go back to that very post. 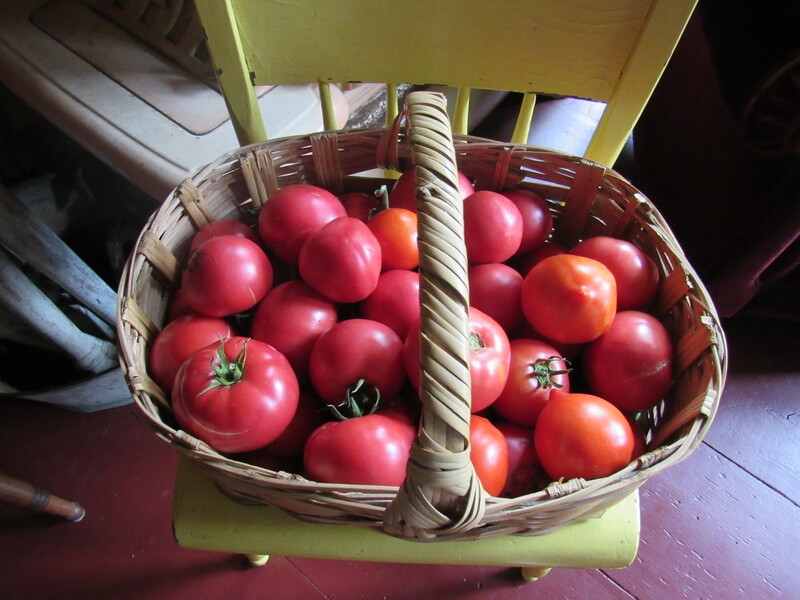 Hope your tomatoes are ripening! 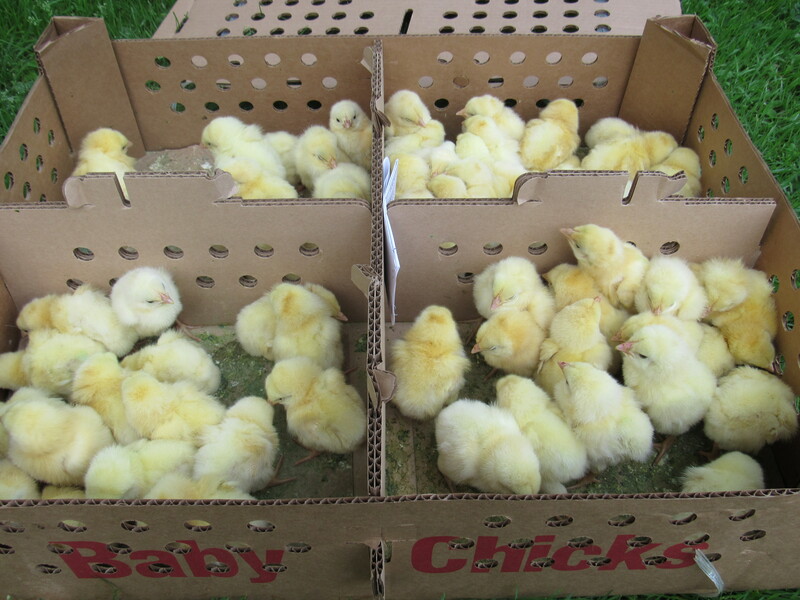 This morning we received that early morning call from our local post office, “your chicks are here”. 60 little meat birds that is. Off we went to retrieve them, wanting to get them home as quickly as we could. After two days of travel, they were ready for food and water. 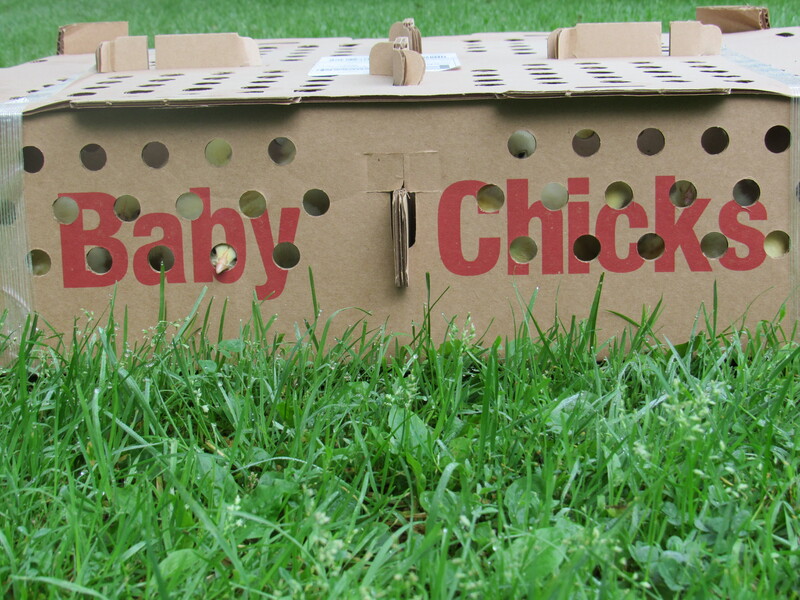 It is not at all uncommon to have new baby chicks arrive in the mail. Most people around here order their birds from a hatchery in the mid west, there are not too many hatcheries in the north east. 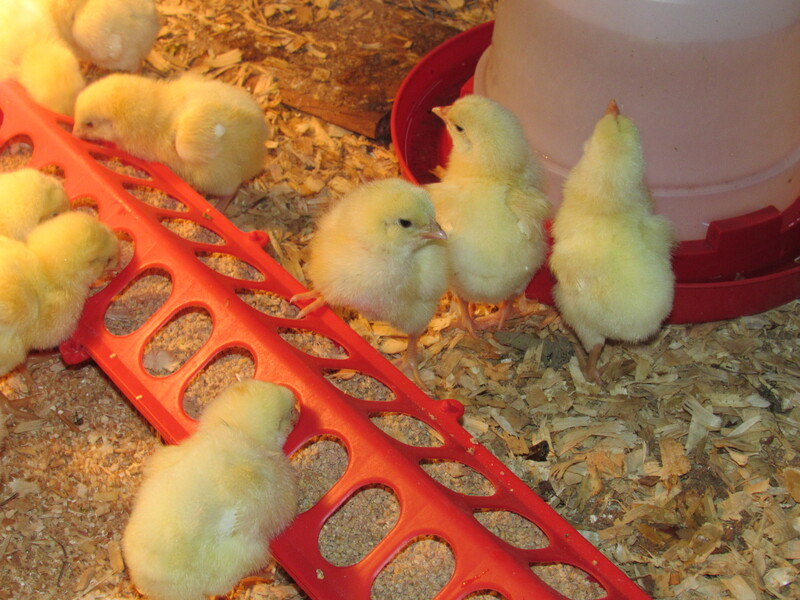 Once we arrived home and unboxed our little hatchlings, we set them up in their brooding area. We use the kid’s old tree house. 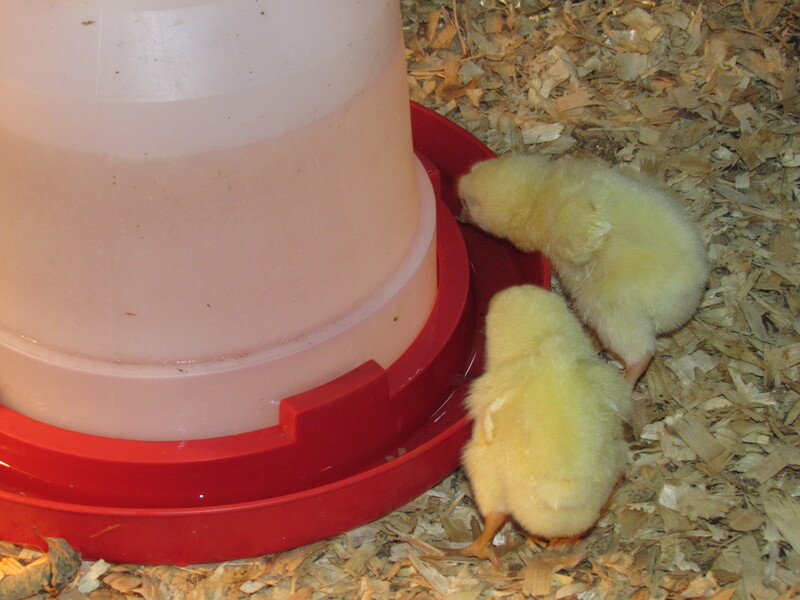 It has access to electricity ( for a heat lamp), is way up off the ground so the chicks are less susceptible to predators, and it’s draft free. 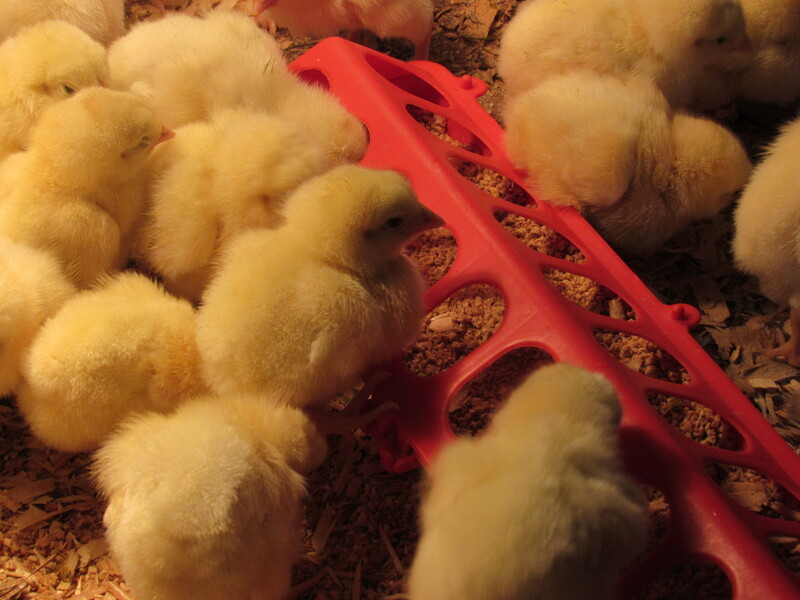 The chicks will remain in their “high rise” until their real feathers appear. Usually they are completely feathered by the 3rd to 4th week. Then they move outdoors into a shaded hoop house, along with an outdoor run so they can spend their time foraging.. Every couple of days we move their housing and their run to fresh grass. Between 8 to 10 weeks they will be ready for butchering. We do all of our butchering here on the farm. This year we are raising birds a bit later than usual. I think in the long run the timing may actually work out better ( than early spring or mid summer), by the time we are butchering it will be the first part of October and much cooler. These 60 meat birds ( remember we cut back this year!) will fill the freezer back up with a winter’s supply of chicken. Home grown, that’s the way we like it! 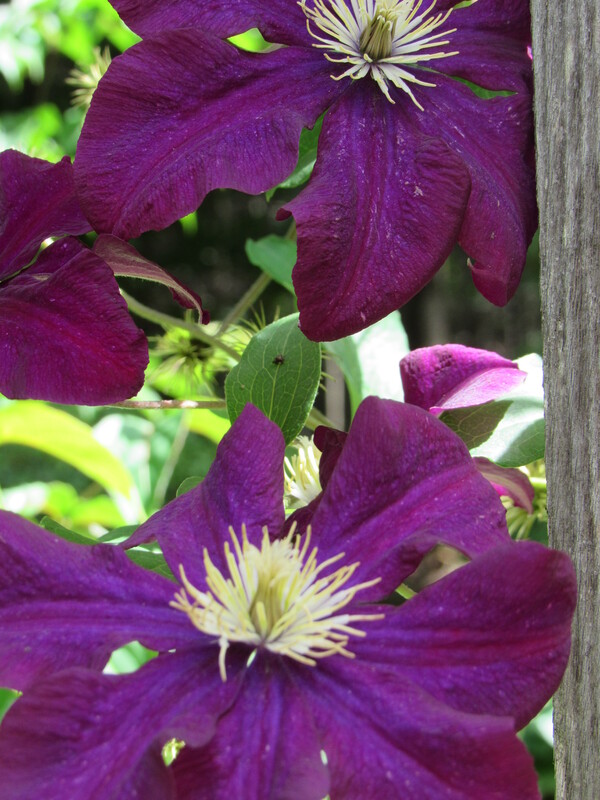 The gardens that are in full sun are a riot of color at this time of year. 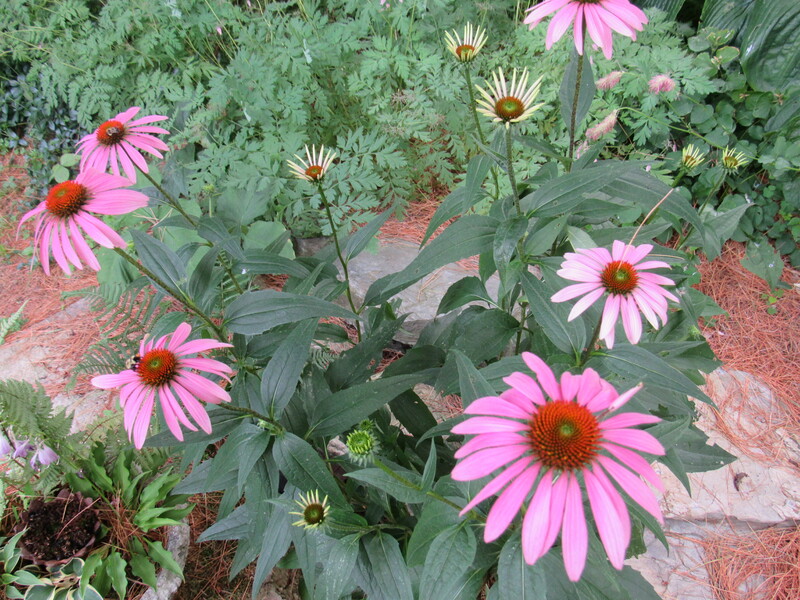 They are planted with a mix of well established perennials and some yearly annuals. In their robust nature, they all seem to be competing for center stage. Such a contrast to the more elegant and graceful nature of the shade beds. 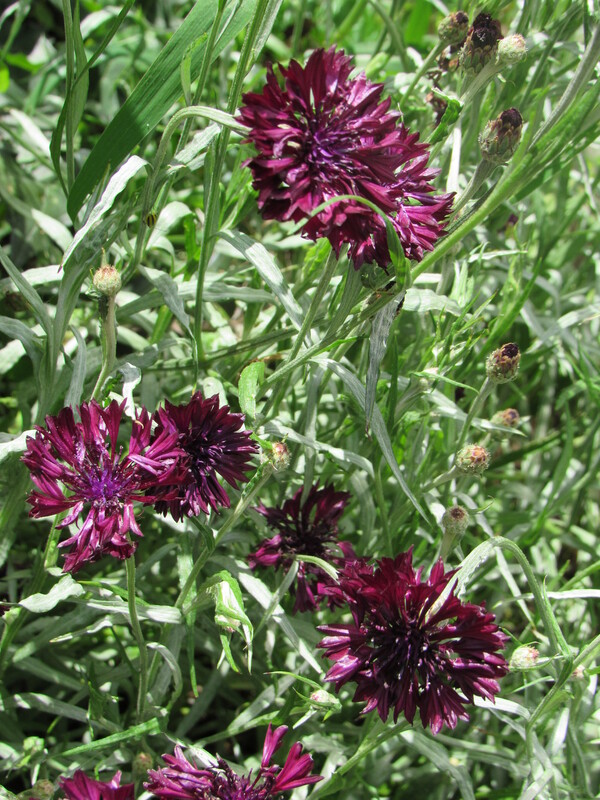 The plants in the shade often being much more subdued than the sun area, but no less striking or appreciated. Truth be told, we appreciate the shade gardens more than ever during these hot sultry days. They seem to invoke a feeling of calmness and serenity, where as the sun gardens can bring forth a feeling of…..well, chaos. Nice chaos, that is. We do work in the shadier display beds more often during these hot spells, certain that the temperature is a few degrees cooler under the canopy of trees. It is much more pleasant in the shade and we will get more done in the long run. That heat can zap our energy long before a day is over, and we can’t have that now, can we? 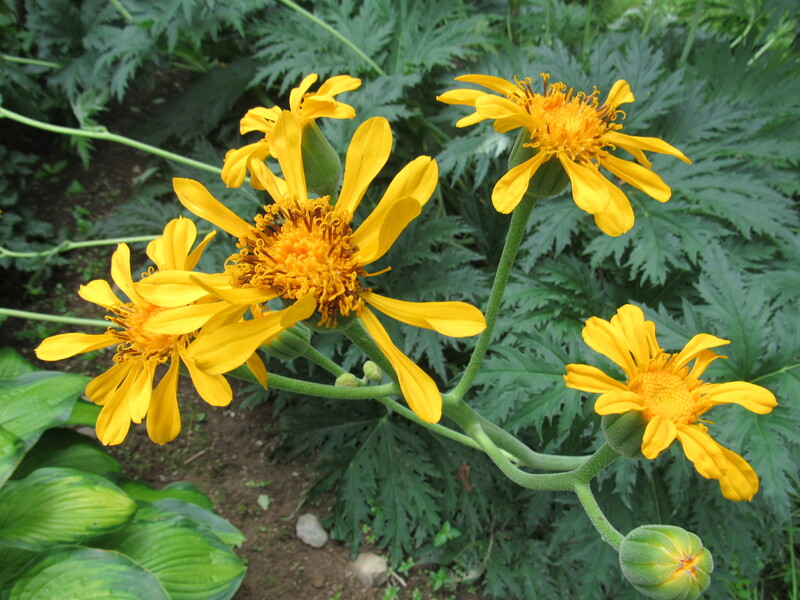 Many of the sun loving plants, along with the overflowing vegetable gardens, are loudly expressing themselves. They are closer to the house and are what we look out at from the big front windows. They are big and bold, and of course we appreciate them as well. 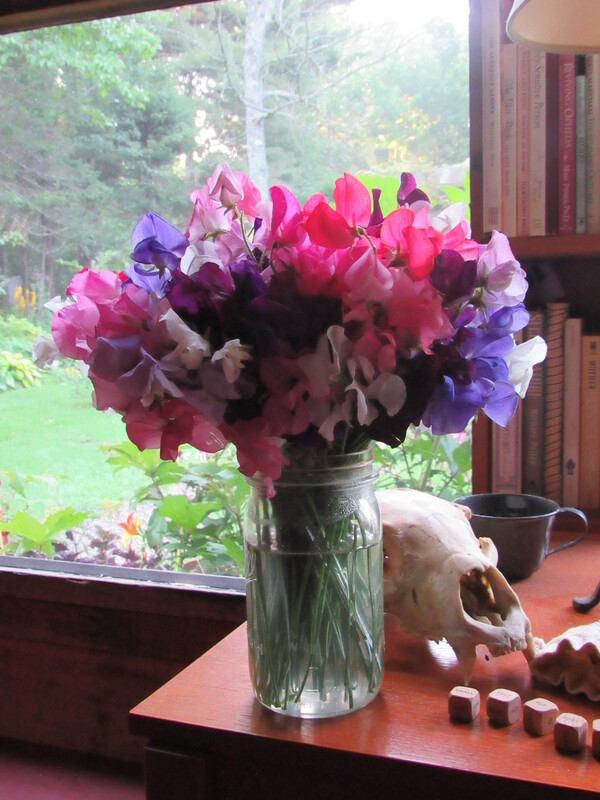 Everyday a bouquet comes in….sweet peas, cosmos, phlox, echinacea, poppies, monarda, to name a few. I am grateful for these lovely arrangements gathered from just outside our doorstep. How lucky to be surrounded by flowers, poetry expressed in the language of flowers. pick squash…again, and again, and again. That should keep me busy until the kitchen is too hot to work in. Oh, and I think we just may be in the hay field this afternoon. The 2nd cut hay is mowed and ready. I love being in the hay field, even when the heat bears down on you and the chafe from the hay sticks to your sweaty arms and neck. A jump in the lake is never any better than after a day of throwing bales. Divine! The satisfaction of having the animals fodder secured for the winter always feels good. People often ask us what we do during the long cold winters here in Maine…… we rest, with a sigh of relief! The pantry shelves are filling up. We are trying to be more thoughtful about the amounts of vegetables and fruits we are canning this year (and freezing). Though it is true that we are often visited by “shoppers” who may come and fill their “to go” bags with goodies (our occasionally returning children), we don’t need as much as we have in the past. Instead of 30 jars of bread and butter pickles, 15 will be enough. The same for dilly beans, sour pickles, relish, and ketchup. Tomatoes and salsa are still being put up in greater quantities. Peaches and jams, we are happy to have enough to eat through the winter and give some as gifts. As our household grows smaller ( boo hoo), we are trying to rein in our efforts to grow and preserve what we actually need instead of preparing for the thoughts of feeding an army. Don’t worry, I haven’t even come close to mastering this concept. It’s a slow process. It is almost painful to put limitations on how many jars of pickled mixed vegetables I make. Are you sure we don’t need a few more quarts of frozen broccoli? Hot pepper jelly? How do I decide which peppers make it into the jars and which ones get offered up to non-hot pepper growing neighbors? And chickens? Every year we raise anywhere between 75-100 meat birds. This year we are scaling down to 60. Geeze! This cutting back makes sense, I know this. With fewer mouths to feed on a regular basis we just don’t need as much. Also, guess what? After years of canning for a full table of eaters, our shelves and freezers still have food from years past. O.k. I’ll just go ahead and admit it, I haven’t seen the bottom of at least two of our freezers in the last couple of years( We have 4 freezers, is this bad?). I’m hoping there may be some chocolate zucchini cakes resting on the bottom. If I stick to this plan of reducing what goes in there, I may reach that cake by February. Just in case, I’ll sneak in a few fresh ones on the top! I remember often the conversations I would have with our daughter Zoe about being raised in a small rural farming community. “Kinda boring”, “Nothing to do”, “Once I’m old enough I’m high tailing it for big city life”. That’s just what she did too, as soon as she could venture out beyond my world here in our humble town, she vacated and moved to Portland. I love visiting her there. She has a great apartment, a great boyfiend, and we always have a wonderful time when we visit her. But now she comes home to indulge in all the things she was so anxious to leave behind. Homegrown food. The flower gardens. Peace and Quiet. The lakes. Sleeping in her old room. 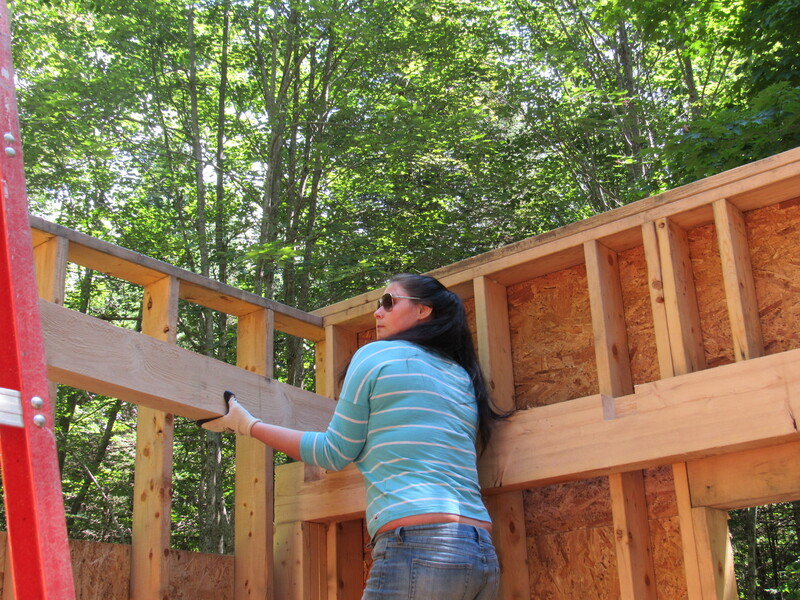 And the very awesome bonus….she wants to come home to help on the farm! Wow! This is great! Time spent with our beloved girl and help with some of the chores that are staring us down. We made kimchi, we harvested vegetables, we stacked two cords of wood, she spent an afternoon helping to lay the floor rafters for the studio, and SHE VACUUMED !!!!!!! I think she’s grown up now and she is pretty amazing. What a lovely thing when your children spring from their nest, find their own niche in the world, but journey back to find comfort in their chlidhood roots. That’s my gal. Thanks for all the help , Zoe……you really are pretty awesome! One last hypertufa class will be offered for the season. For all those who didn’t get a chance to build their own hypertufa this summer, a class will be offered on Sunday, August 23rd, from 1:00 -3:00. 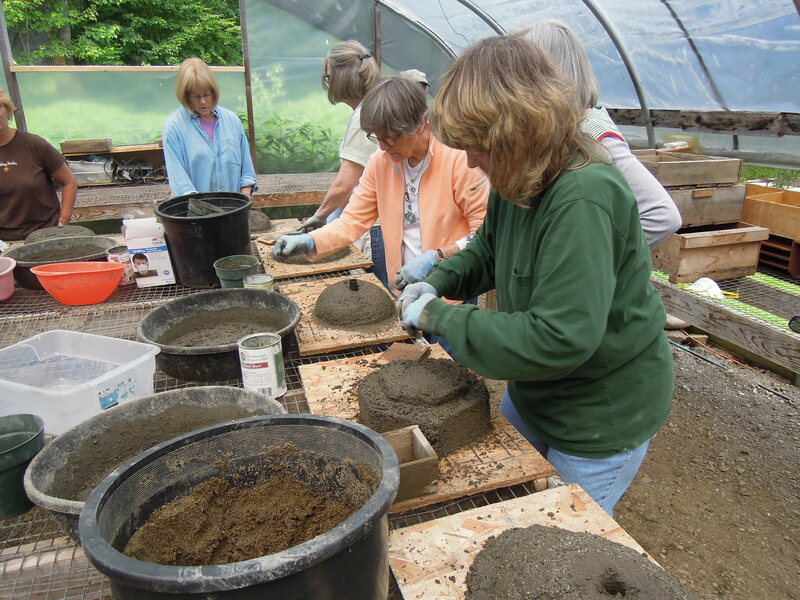 Come learn the process of building a hypertufa and leave with your very own vessels to plant in. As usual, freshly baked scones and tea will be served. There are 10 spots available, please call or email us if you’d like to join in ( fernwoodnursery@fairpoint.net) and check out this posting for more information on hypertufa. 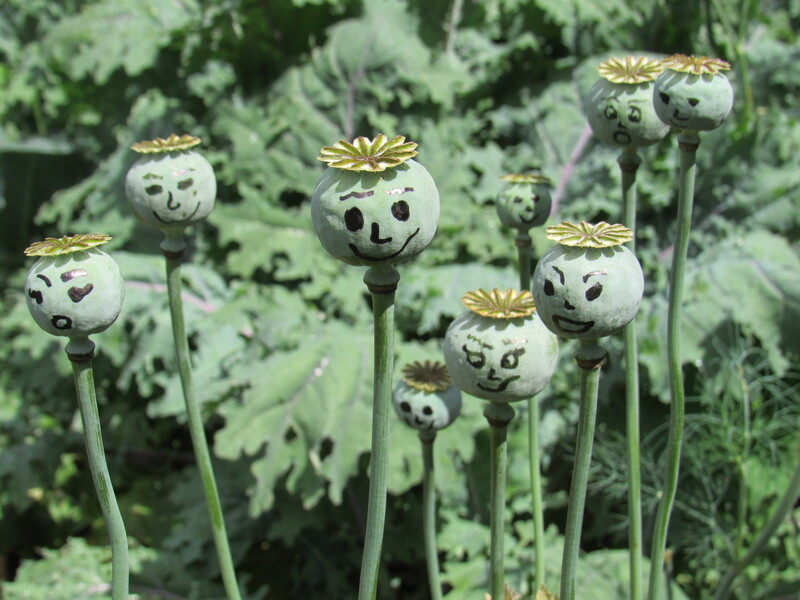 The drying seed heads of the poppies needed a little ” perking up’. It’s hard not to want to yank them from the garden as they begin to brown, they look rather scraggly. These smiling face help……..too much weeding in the hot sun I guess, I just couldn’t help myself! 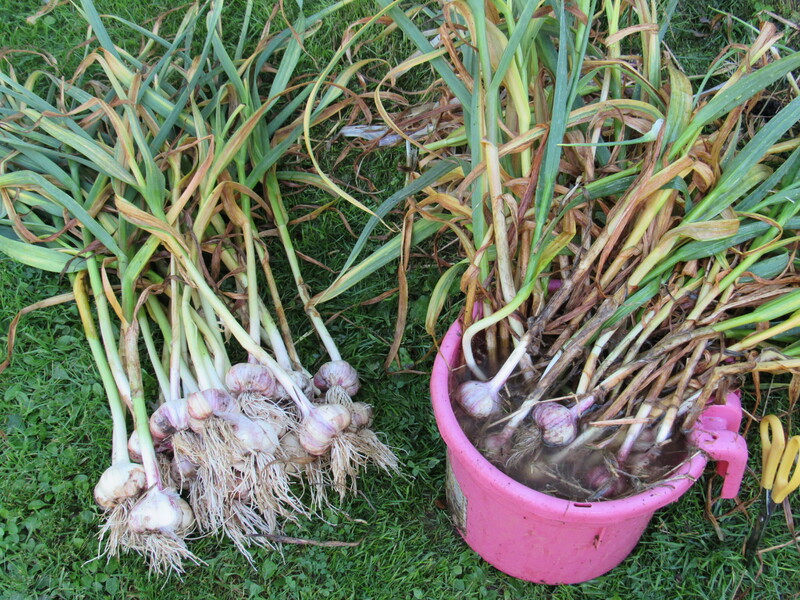 We have pulled this year’s garlic crop from the garden. A pantry with a winter’s supply of garlic is like a woodshed filled with firewood, a barn stacked with second crop hay, and your freezer stocked with oodles of homemade pesto ( along with everything else harvested and put into it!). 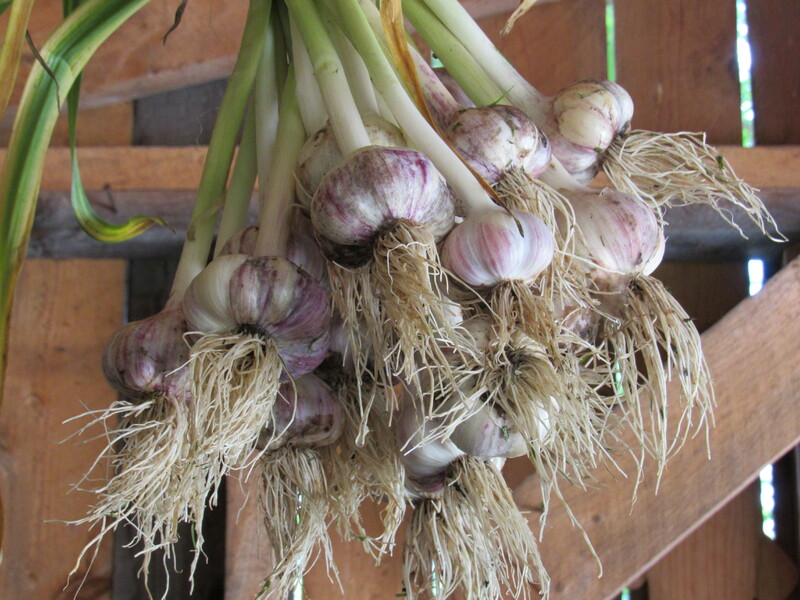 Garlic is an important crop here, hardly a meal gets made without the addition of garlic. As I have said before, these well tended caches are like money in the bank. So much effort goes into growing a substantial amount of our food, it’s no wonder that we feel some comfort and delight when the larders start filling up. Also, some relief that another seasonal chore is complete. 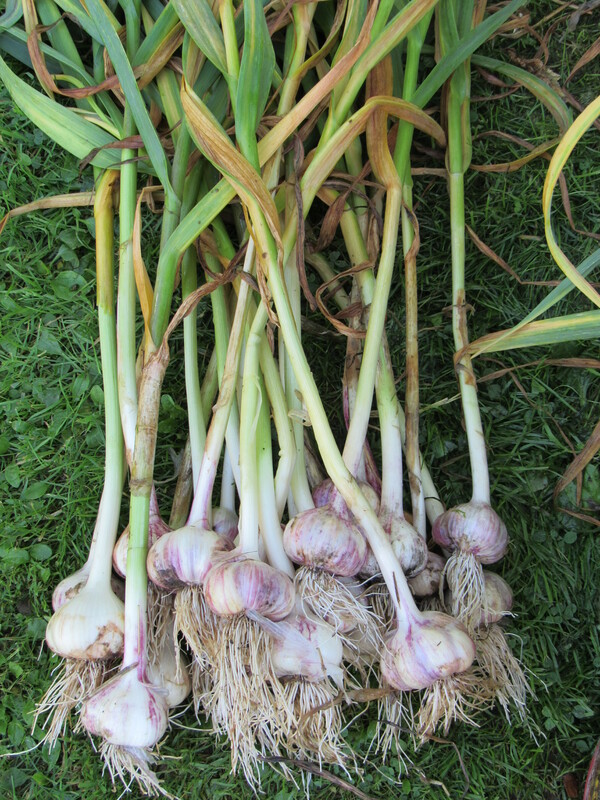 The garlic has been picked, washed, and is now hanging to cure a bit. That means I won’t be spending anymore time weeding it. A little less weeding? I’m o.k. with that!